Nutty, gooey, cinnamony, delicious! The Cinnamon Swirls Gift Box is a scrumptious present for anyone with a sweet tooth. This gift box comes with two 1 lb. cinnamon swirls (serves 10-12). 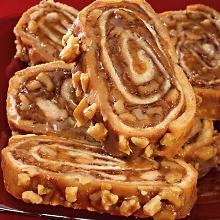 These are hand-rolled, packed with cinnamon, walnuts, applesauce, topped with chopped walnuts, and baked to a light crisp. Just heat, cut, serve, and enjoy (and then enjoy some seconds)!